Not only is this packed with nutrients, but it tastes great! My kiddos ask for this, and since my son doesn’t eat many vegetables this is a great way to get more in him. I mix up the liquids depending on what I have on hand. I had coconut milk, but I also use almond milk or even a juice like apple or one of the green RN Knudsen’s blends. 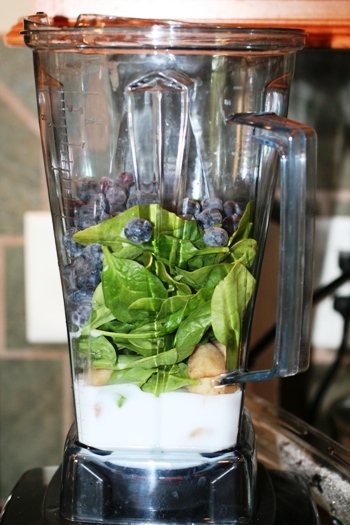 Mix in a blender and serve!! We do the same thing, however, use broccoli slaw in place of spinach, my kids ask for it. How do you freeze your bananas? Just made the smoothie recipe, I really like it! I think my kids will as well. Mine turned out green, not purple. I think they will drink it anyway. Thanks for this recipe! Katrina – I get the brown ones and cut them into thick slices and put them on a cookie sheet. Freeze then pull off and put into a gallon freezer bag. I have a whole post on Flash Freezing you can checkout. Well that does look like a whole lot of healthiness in one cup. I’m sure that there are lots of antioxidants with the blueberries. Made these for my family tonight to go along with a nacho casserole and they all loved the smoothies! That is a record around here: 7 likes out of 7 people! I used some mango in the second batch and they loved those too! Hooray! I am sooo excited and thankful to learn of this way to use up spinach (or broccoli as Sandy H. mentioned) before it goes bad, as well as get a variety of healthy fruits and green veggies into my children’s diets. Only 3 out of 7 like blueberries, 2 out of 7 like spinach, and 4 out of 7 like mangoes so you can understand my ecstasy when all but one asked for seconds! Thank you Kelly! You’re batting a thousand with the smoothies! Good for you, and you are more than welcome! Thanks so much for the great smoothie recipe Kelly! Also would like to say thank you for your spiritual writings included in your blog. Very inspiring! Love your site! Carolyn – So glad you enjoy it. 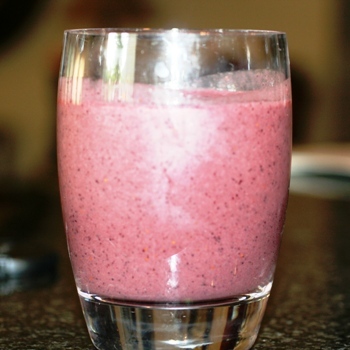 This is my absolute favorite smoothie, I think we make it just about every day! And, thank you for your encouragement, it means so much to know that our transparency is helping others. I’ve been looking for more smoothie recipes, I do the same thing – just use whatever juice I have on hand. pineapples and orange juice added make a great smoothie too. I will also use kale which is power packed with vitamins.